The Boston Terrier is a kind, gentle, well-mannered, easygoing and friendly dog. He's loving and loyal, and is protective toward his family. He loves to both give and receive cuddles and attention, and will jump up on you to express his joy. He wants to be by your side, and shouldn't be left alone in a yard all day; he is unhappy without his family and human contact. He loves to play games outdoors, and needs short walks and romps in the yard, but he's sensitive to temperatures, and so isn't really an outdoorsy dog. He's sociable with strangers, and generally calm and well-behaved inside the house--with periods of rambunctious playfulness! He gets along well with other pets, and is especially good with and protective toward children. He can get a bit nippy if youngsters are too rough with him. He barks only when necessary (for example, to alert you of a stranger), and makes a very good watchdog. His is eager to please and generally easy to train, although he can also be independent and strong-willed. He is difficult to housebreak. He may snuffle, snort, drool, or be gassy. He is a medium-shedder; you will find quite a bit of hair around the home and on your clothes. 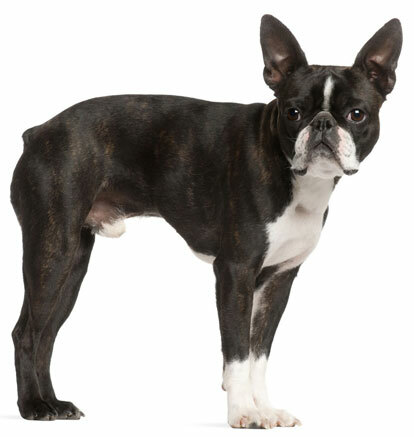 The Boston Terrier is 15 to 17 inches tall (to shoulders) and weighs 10 to 25 pounds. He has a short coat smooth and fine in texture. His coat color is white with either black, brown, or brindle. The Boston Terrier is an American breed developed after the Civil War as a fighting dog. He was originally a cross between an English Bulldog and an English Terrier. Over the years, the fighting instinct was deliberately bred out of the Boston Terrier to make him a true companion and housedog. The Boston Terrier Club of America was formed in 1891. He was admitted to the AKC in 1891, and his AKC popularity was 16th out of 157 breeds in 2007.